You won’t find anything like it in WNY! The JCC offers programs designed for every person, of all fitness levels! For groups from 8 – 800, our outdoor challenge course is a great way to stimulate teamwork, encourage cooperation, instill trust, and bolster confidence. 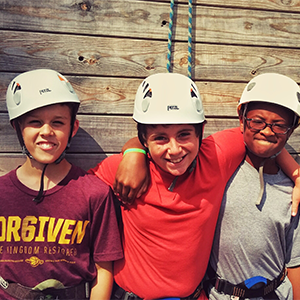 The JCC’s Challenge Course at the Irving M. Shuman Campgrounds is a great opportunity to have fun while experiencing a powerful disruptive moment that facilitates positive group and individual growth. To reserve your event, please contact 716-688-4033. We are located on the beautiful Irving M. Shuman Campgrounds just behind the JCC of Greater Buffalo in Getzville. The campgrounds have acres of nature trails winding through wooded wetlands, a huge sports field, rustic amphitheater, large pavilions, and an amazing challenge course. Our High Challenge Course is comprised of two climbing faces on an outdoor climbing tower, a double zip line over Ellicott Creek,a two level high ropes obstacle with 14 elements, a Giant’s Ladder, and a Power Pole. Our Low Challenge Course is made up of over 10 elements such as the Nitro Swing & Whale Watching Platform, as well as tons of games and initiatives that take place in our woods and fields. You will walk away with increased self-confidence and self-worth, new found leadership skills and decision-making skills, new ways to communicate, better trust and respect for individual differences and improved problem solving skills while having a blast! Want to come check out the challenge course? We’re open select Sundays in the late spring, summer, and early fall for Adventure & Explore! See you there! We believe that your experience with us should be more than just fun and safe. It should be filled with experiential learning, personal growth, and outdoor appreciation. It is with that in mind that we have adopted the philosophies of Universal Respect and Challenge by Choice. Universal Respect means that everything should be treated with respect – our peers, ourselves, the environment and our leaders. Challenge by Choice means that the participant chooses their own level of challenge. By allowing this, the experience encourages growth, and the possibility of physical or emotional injury is reduced. 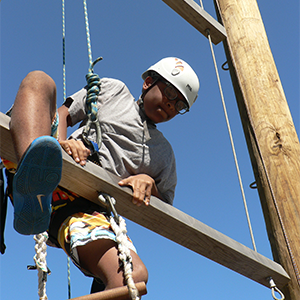 The JCC’s Irving M. Shuman Campgrounds and Challenge Course provides a wide variety of activities catered to meet your group’s needs. Our dedicated staff will design a program to meet your needs. Whether you’re a newly formed group that needs some help or an already functioning team that wants to step it up to the next level, we can help. In traditional teambuilding, groups are given a series of problems or tasks that they must solve together. Each team is unique as to what strengths they possess and what areas they need to work on, so the facilitator adjusts the goals and challenges accordingly. After each challenge the facilitator will “process” the group. Emphasis for these activities can be placed on trust, communication, group problem solving, cooperation, etc. We offer TONS of activities and courses and are always developing new ones. If there’s something you want that’s not on the list, just ask! Below is a quick overview of some of our most popular options. Groups are givens a series of problems or tasks that they must solve as a group. Each team is unique as to what strengths they possess and what areas they need to work on, so the facilitator adjusts the goals and challenges accordingly. After each challenge the facilitator will “process” the group. Processing is the act of talking about the last challenge to discover the strengths and weaknesses of the group and to keep improving skills as a team. Emphasis for these activities can be places on trust, communication, listening, leadership skills, strategic planning, group problem solving, cooperation, and more. This can be a 1 or 2 block activity. We recommend 2 blocks as it allows for greater progression of the teambuilding process. This is our most mentally challenging element and intended for older participants who want to expand on the basic ropes experience. The Power Pole is unlike any other element we have. Participants climb to the top of the pole, stand on the top, and leap for a hanging ball. We have a basketball court, GaGa pit, as well as fields to play kick ball, soccer, football, or frisbee. We can organize a real game for you (like ultimate Frisbee or soccer) or just set out the equipment and let everyone play while we supervise. This is a great way to burn off some excess energy before getting back on the bus. 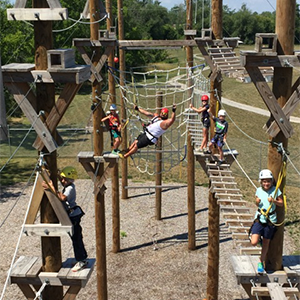 The High Ropes Course will test your nerve, sharpen your skills, and challenge you individually and as a team. Maneuver your way through a series of obstacles dangling in the air. This activity allows many participants to be up in the air at once. This is the advanced version of Outdoor Skills. Focus is places on survival situations, shelter building, wilderness first aid, fire starting, water finding, and edible plants. Although being an individual challenge, the Rock Wall is an excellent extension of teambuilding. Each person is responsible for setting their own goals, but it often takes the support of the whole team to encourage one another to meet their goals. This activity is a great introduction into archery. Participants will learn how to safely fire a bow and the proper technique of shooting. Soar 500 feet over Ellicott creek on our epic Dual Ziplines. Explore our boardwalks over 10 acres of wetlands with one of our fantastic naturalists. Our most physically challenging activity. Two participants work together to ascend this 40 foot ladder made of wooden planks 5 feet apart. Learn some basic skills for the outdoors. Students are introduced to the concept of Leave No Trace as well as learning about the 10 essentials, how to properly build a fire, and more! Where can we reach you with any questions we have?